In the mid-1980s during my time at IBM, I remember an “empowerment” initiative that swept through the company. We attended training programs and learned that to be empowered meant we had to take more responsibility and be accountable for the results. Over the next couple of years the strategy unfolded, as IBM pushed more authority to lower levels of the organization. Eventually I headed up a “business unit” with P&L responsibility and had more authority to make decisions on discretionary spending. Looking back, it’s not clear to me that these changes had any real impact on our business results. Still, I felt good that IBM gave me a bit more authority. That’s an example of what academic researchers call “psychological empowerment”—giving employees a sense of control in how they do their jobs. This can lead to higher levels of job satisfaction which can boost productivity and increase retention. Empowering employees in a business model that isn’t competitive won’t make the business competitive. Yet, despite more empowered employees, IBM performance suffered for many years during that period. The turnaround came when Lou Gerstner took charge in 1993. That year IBM posted a $8 billion loss, on top of nearly the same deluge of red ink from the previous two years. Was the problem not enough empowerment? Hardly. In his book Who Says Elephants Can’t Dance? Gerstner writes that he found IBM culture “inbred and ingrown,” preoccupied with itself rather than customers. Through it all, our guiding light came down to two words: customer focus. It has proved both galvanizing and clarifying, serving as the criterion for reexamining a whole lot of dogma, and for resolving many of our seemingly intractable internal debates. This story illustrates that empowerment has limits. Empowering employees in a business model that isn’t competitive won’t make the business competitive. You still have to deliver products and services that customers want, do it better and faster than competitors and manage costs. Empowerment is not a panacea. Participative decision-making: Employees and/or teams may have input into and influence over decisions ranging from high-level strategic decisions to routine day-to-day decisions about how to do their own jobs. Skill/knowledge-based pay: Employees share in the gains of the organization and are compensated for increases in their own skills and knowledge. Open flow of information: Includes flow of information upwards and downwards in the organization, to so that employees have ‘line of sight’ about how their behavior affects firm performance. Flat organizational structures: Empowering organizations tend to be decentralized where the span of control (more subordinates per manager) is wide. Training: Educative efforts enable employees to build knowledge, skills, and abilities – not only to do their own jobs better but also to learn about skills and the economics of the larger organization. Said another way: To build customer loyalty, reduce the frequency that an employee has to get approval from the boss to get stuff done! One obvious application is service recovery. If a customer calls to complain, an empowered employee can take the initiate to offer an accommodation. Ritz Carlton takes it as step further, empowering employees to spend up to $2000 to delight a guest—not just to fix problems. Empowerment is not limited to call centers or service interactions. In the often painful car buying experience, one sales ploy is “checking with the boss” as part of the haggling process. Much like customers prefer a “one and done” customer service experience, Maritz Research found that car buyers want to deal with as few people as possible: 64.0% of customers are completely satisfied when one person with pricing authority negotiates the deal, compared with 20.7% when two or more are involved. Type of people: Theory Y managers, employees with high growth needs, high social needs, and strong interpersonal skills. Empowerment is not a good fit when a company is working in a “production line” approach. For example, when you go to a quick serve restaurant, you don’t want the employee to be empowered to change how the food is prepared. Consistency is part of the value proposition, whether you’re eating a hamburger at McDonald’s or sipping a latte at the more experiential Starbucks. To build customer loyalty, reduce the frequency that an employee has to get approval from the boss to get stuff done! It should be clear that empowerment is not about technology, at least not directly. Yet technology is one way to improve access to opportunity, information, support and resources. Here are a few examples of how technology can support empowerment. 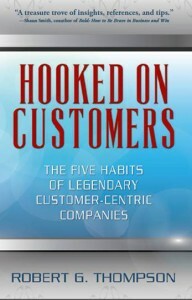 Let’s start with listening, one key habit of customer-centric firms. Customer experience expert Lynn Hunsaker of Clearaction found that presenting Voice of Customer survey results to all employees was one of six best practices in high-performing B2B organizations. 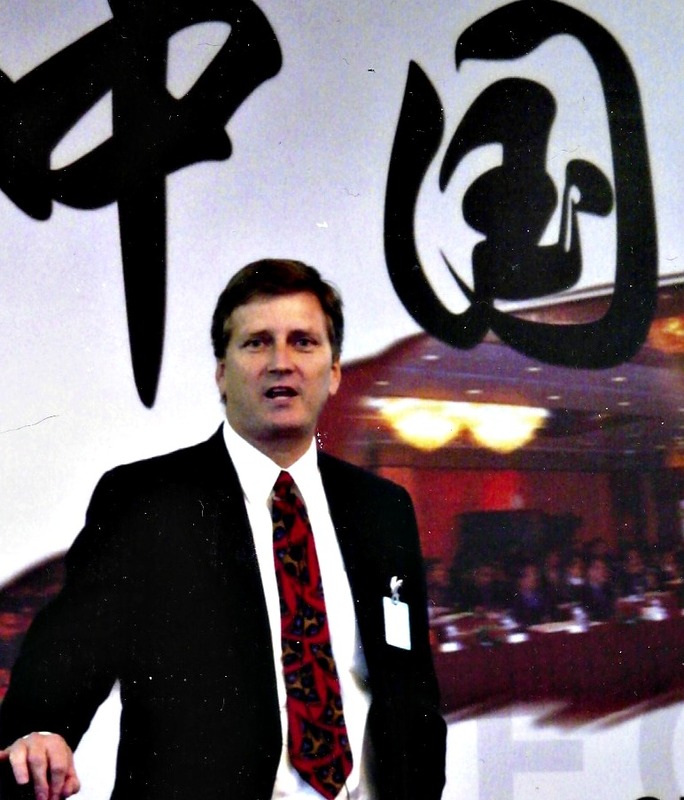 At Applied Materials, for example, they created and shared reports throughout the company so that “every sales office and functional area across the company could see their own impact on customer experience.” Increasingly, Enterprise Feedback Management (EFM) systems are used to collect, analyze and distribute results to stimulate action by the responsible department. Of course, customer feedback comes in many forms, not just surveys. Customers also share their opinions in social channels, such as blogs, review sites, Facebook and Twitter—content that can be “mined” using social analytics solutions. Best Western integrated TripAdvisor reviews with traditional survey feedback, in a collaborative solution developed with EFM provider Medallia. If a guest has a bad experience and posts a review on TripAdvisor, the “social EFM” system sends an alert to the hotel manager for immediate action. While it’s true that customers have empowered themselves with social media, social applications can also help employees be more responsive. Empowerment is not just just something bestowed by managers. In Empowered, authors Josh Bernoff and Ted Schadler recount how employees can empower themselves with consumer grade mobile, video, cloud and social technologies. One out of three employees use some form of do-it-yourself technology—often not sanctioned by the IT department—including online productivity tools (e.g. Google Docs), document management (e.g. Box.net) and microblogging (e.g. Yammer), just to name a few. While it’s true that customers have empowered themselves with social media, employees can also take advantage of social applications to be more responsive. 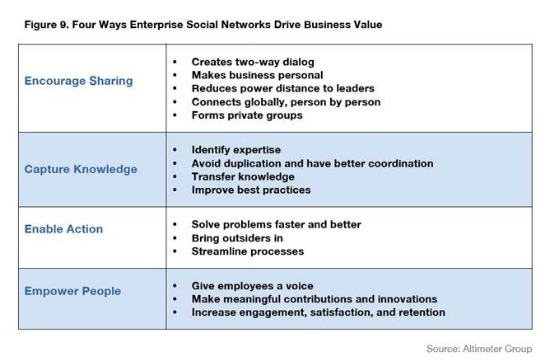 Organizations that already have a collaborative culture seem best suited to benefit from an Enterprise Social Network (ESN), which advocates say can accelerate employee on-boarding, speed up decision-making, and help people find experts. A study by Altimeter Group found that empowerment was one of four major ways that ESNs can drive business value. In call centers, real-time speech analytics is an innovative way to empower agents to add more value during customer interactions. During a live phone call, technology from NICE can analyze the spoken interaction and generate customized actions for the agent to prevent churn, up-sell, etc. This is a huge improvement from rigid scripts that leave customers feeling like they are talking to a machine. But, let’s remember that the context is important. Financial services firms, for instance, will require that certain interactions follow a script to comply with laws and regulations. Customers want to deal with employees empowered to serve their needs. Use empowerment to help unleash the energy and creativity of your workforce. But to maximize your success, take a tip from Jeff Bezos, founder and CEO of Amazon.com, one of the world’s most customer-centric companies: “Determine what your customers need, and work backwards.” Understand what drives customer value, then figure out where empowerment can improve the quality, speed and cost with which that value is delivered. Want to Empower Call Center Agents to Delight Customers? Improve Your A.I.M. Employee Engagement: Putting the Cart Before the Horse? Is Social Software the Cure for Business as Usual? Take the “Red Pill” to Find Out! IBM launches Customer Experience Lab. Good or bad news for CX movement? The Omnichannel Service Experience – Coming Soon or Just a Tantalizing Mirage?